I am not a little proud to announce my third anthology in The Quill Collective series. Never heard of it? Aha! Likely because we have only coined the name when I decided to do another Austen-inspired anthology, and well, “series” would best indicate a number of books coming one after the other. You might better recognize the previous in the series as The Darcy Monologues and Dangerous to Know: Jane Austen’s Rakes & Gentlemen Rogues. When asked about doing another anthology, readers frequently suggest another Darcy book or Elizabeth’s stories… But for me, it seemed to make sense, during this time of forwarding feminist sensibilities and given the verve of the present equality movements that the female perspective might be embraced amongst the Austen fandom—possibly beyond our polite borders. After all, Austen wrote of strong women who were ahead of their day. Jane Austen’s novels evoke romantic imaginings of fastidious gentlemen and gently-bred ladies … Yet through her veiled wit, honest social commentary, and cleverly constructed prose in a style ahead of her day, Austen’s heroines manage to thwart strict mores—and even the debauchery of Regency England—to reach their fairytale endings. But have you never wondered about her other colorful characters like Mary Crawford, Hetty Bates, Elinor Tilney, Louisa Musgrove, et al.—and how they came to be? In Persuasion, Mrs. Croft says, “But I hate to hear you talking so, like a fine gentleman, and as if women were all fine ladies, instead of rational creatures. We none of us expect to be in smooth water all our days.” Those words have always struck me as terribly modern and I have wondered what Mrs. Croft might have been thinking of when she said those very words to her brother Captain Frederick Wentworth. I believe several of Jane Austen’s characters might have had feminist sensibilities, even if they yielded to the expectations of their sphere. It is our intent that in this collection of backstories or parallel tales off-stage of canon to remain true to the ladies we recognize in Austen’s great works—whilst stirring feminism in the hearts of some of these beloved characters. Thus, our title was born. Rational Creatures. Coming to you in October 2018. Stay tuned. Once again, an extraordinary dream team of authors—I will refer to this group from here forward as #TheSweetSixteen—have entrusted their words to me. Previous anthology authors Karen M Cox,, J. Marie Croft, Amy D’ Orazio, Jenetta James, KaraLynne Mackrory, Lona Manning, Christina Morland, Beau North, Sophia Rose, Joana Starnes, Brooke West, and Caitlin Williams are joined by Elizabeth Adams, Nicole Clarkston, Jessie Lewis, and Anngela Schroeder. And if that isn’t enough for your “wow factor,” acclaimed author, Jane Austen scholar, and Guggenheim Fellow Devoney Looser is to write the foreword! I know, right? Wow! Just wow. #RationalCreatures indeed. Northanger Soapworks has specially created a “Rational Creatures” soap: fresh scent with notes of bergamot, apricot, and currant. Paper & Slate has customized a “Rational Creatures” candle scent of white tea and plumeria. One prize package will be sent to one randomly drawn name. Simply visit and comment at all three blog stops for this announcement: JUST JANE 1813, Austenesque Reviews and From Pemberley to Milton. In the third romance anthology of The Quill Collective series, sixteen celebrated Austenesque authors write the untold histories of Austen’s brave adventuresses, her shy maidens, her talkative spinsters, and her naughty matrons. Peek around the curtain and discover what made Lady Susan so wicked, Mary Crawford so capricious, and Hetty Bates so in need of Emma Woodhouse’s pity. Since Christina said she would be making an announcement today I have been trying to decide who it would involve. I must admit this never entered my head! I love the author line up and the cover so I will definitely have to read it even knowing there won’t be any Darcy stories! Great work as always Christina. Thanks to all for sharing this news. I’m very curious myself Glynis! And I’m very happy she brought some new names like Nicole Clarkston and Elizabeth Adams into the group 🙂 Girls do run the world hunh? Thank you, Glynis. We wanted to try something a little different. Especially since we already did a big Darcy book last year and there seems to be a surfeit of Darcy POV novels these days… And there is always a lot with our believed Elizabeth… I do hope you will give this collection a try. Thank you for being part if this endeavor. You are one of the busiest women I know–I feel lucky that you are making time for this! Hello Rita, thank you for this announcement post! I would like to make my compliments and best wishes for this new anthology to Christina and all the author that worked on it! I like the idea of a female anthology in this time when movements such as #metoo are spreading through the world, I absolutely have to share this! I am sure a lot of feminists will be happy to see that even after her death Jane Austen is doing her best! I like the cover too, the way the female face occupies all the space is inspiring! In the end I want to say my thanks for the giveaways, the prizes are wonderful… even if I would like to win the book, it seems a little piece of art! I am so happy by your enthusiasm. Truly is the cherry on top of a terrific day. Thank you. I think we will all be inspired and even a little surprised by the stories. Thank you. I was just over at Claudine’s [Just Jane 1813] and was so surprised to learn of this project by Christina Boyd. So many NEWS worthy firsts. I love that cover. Thanks Rita for hosting … you guys are doing a fantastic news blitz and that is so exciting. I will check out the other posts. I wish much success to the authors and can’t wait to see this in print. Fantastic! Can’t wait. Thanks for sharing. Lovely cover and awesome authors. Shari Ryan at MadHatCovers always does a great job with the covers for this series. Thank you. Congratulations on the new book!! So glad that the secret is out! I love the cover of the new collection–very excited! I am so glad we can finally share the news, all at once. I am so excited! I have been patiently (well…sort of) awaiting this announcement! Gorgeous cover! I can’t wait to see what these amazing authors bring us! I am thrilled Dangerous to know is now on audio! Such a fun way to revisit these stories! Congratulations one and all! Thank you! It has been a busy 24-hours of news. The audiobook for our #RakesAndGentlemenRogues went live yesterday. Hope you get a chance to listen. Our voice actor is marvelous. I’m so excited to see the release of another anthology. I look forward to reading! Thank you, Rita, for your participation in — and your enthusiasm for — this collection of stories. Isn’t the cover gorgeous? I love the contrast of pink and charcoal and the ribbon tying this book to her brothers, TDM and DtK. I’m thrilled to be on Christina’s #TheSweetSixteen team. But, wow, it’s been many, many decades since I reached that teenage milestone. In the spirit of feminism and to quote Helen Reddy’s song, “Oh yes, I am wise, but it’s wisdom born of pain.” It will be interesting to learn the wisdom — and, perhaps, the pain — of Austen’s female characters, her Rational Creatures, in this latest Quill Collective anthology. Can’t wait! Good luck to your readers in the fabulous giveaways! Joanne, You are always so good! 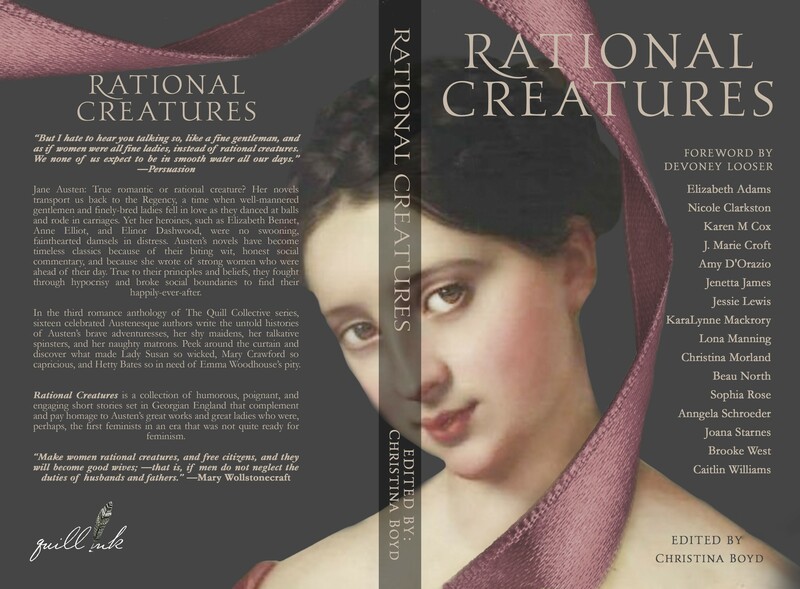 I can’t wait until readers read your Rational Creature. They will be sooooo moved, I think. I know I was when I first read it. Congratulations to all involved! Break out the Champagne!!! Thank you! I am so glad you are interested in this project. Yay! I’m so glad you could host us, Rita. The secrets out and I don’t have to keep mum about that gorgeous cover. 🙂 Such a treat to be part of this fabulous project. Thank you, Rita, for hosting this! Excited to be working with such a fantastically talented group on this project. Thank you, Nicole, for joining our project. It is going to be a diverting experience indeed. I absolutely adore this cover! It fits so beautifully with the colour scheme of ‘The Darcy Monologues’ and ‘Dangerous to Know’, and the lady chosen for the cover is just perfect! Thanks so much for this wonderful announcement for the Rational Creatures, Rita! I’m so excited to be part of Christina’s new anthology along with my favourite authors and dear friends – this dream team is amazing! I can’t wait to read your stories, lovely ladies! Thank you, Joana. For everything. Loved the first two anthologies, can’t wait for this one! YES! That’s what I want to hear. Wonderful feature and giveaway. Great authors. Thanks. I’m in an anthology! AND there’s a BIG giveaway package. Check it out!!! My next writing project is announced! Thank you, Karen! Super excited for this project. Thank you, Rita, for hosting this announcement and cover reveal. I appreciate all your enthusiasm from the start and for all your author suggestions when first assembling this collection together. I am hoping others are excited about this endeavor as you are. Thank you so much. Congratulations on another upcoming anthology! I can’t wait to see what stories have been created around those fascinating characters of Jane Austen’s. Thank you! I appreciate your enthusiasm and look forward to reading all the stories myself! I am so excited to have a new anthology to look forward too!! Thank you—it releases in October. Hope you don’t mind the wait. I am sure this will be as wonderful as the previous two anthologies. Looking forward to reading it. Thank you for the giveaway. Awww, that is so kind of you tonsay. Thank you. I know — who would have thought she had any courage or independence…CAN’T WAIT for you to read that story! It is surprisingly poignant — yet still so true to the Miss Bates we know. The cover is stunning! Looking forward to reading this new collection this fall. The more I look at the cover, the more I like it! Me too. I think her expression is bewitching. My initial guess is that Christina Boyd will once again gather several well known and popular authors of Austenesque fiction to tell stories from Jane Austen heroines’ perspectives. I feel it is time for the female voices be heard as she has already edited two anthologies from Darcy and Austen’s bad boys point of view. Thank you for sharing this good news with us, Christina. I am so happy you are as excited for us—thank you. And this project. I am super proud of the effort so far and the stories from #TheSweetSicteen. I think so too! Thanks! Thank you! We are thrilled that Devoney Looser has agreed to write the foreword. 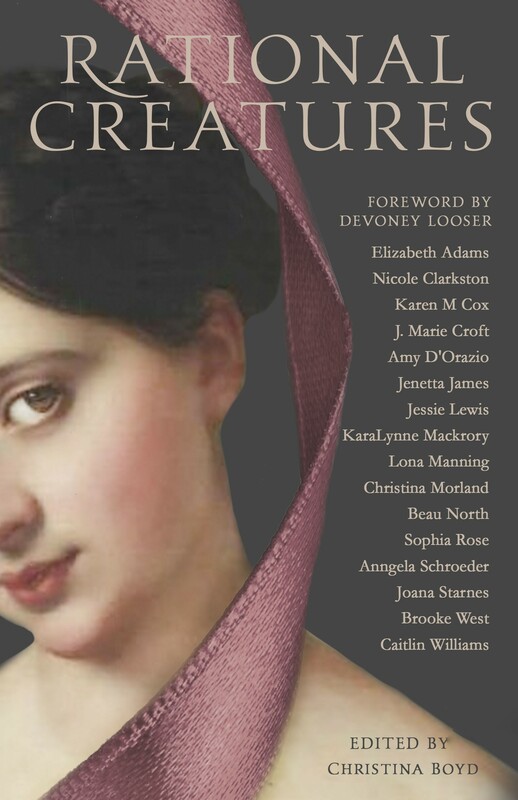 I couldn’t think of anyone more perfect to introduce this anthology about several of Austen’s female characters, written by female authors, and for anyone with interest in the themes. Feeling honored. Looking forward to reading this anthology account hope to gain new perspectives on Austen’s other feminine characters. Wishing all involved the very best of luck with this new book! Thank you! We are all busy at various stages of the stories. I am super excited. Great group of authors and such a stunning cover. Can’t wait to read it! And thanks for the giveaway. . Thanks for being part of the announcement and cover reveal Rita. I may be absent a lot at the moment, (that pesky thing known to us all as Real Life is being particularly annoying in that respect at the moment) but I just had to pop in, somewhat belatedly, to wish Christina and #TheSweetSixteen, more congratulations and best wishes for the (eventual) release of Rational Creatures. October seems so far away! The cover is simply gorgeous and it’s lovely to see the ribbon motif linking this with TDM and DtK. Although this is a volume of a number of Austen’s female characters, I’m sure none of us would object to an Elizabeth Bennet equivalent of TDM if there’s to be a fourth anthology in the future! Thank you, Anji. Working hard to make all our deadlines. October will be here sooner than expected. (We had to announce now—it would have been too much to to ask 16 Authors—and me—to keep the secret that long.) At least this way we can do promotion and have more giveaway opportunities! This book sounds like another winner. Though I had hoped for more Darcy. Can you ever have enough stories about him? I really like that the ladies that do not take centerstagr now get to shine. We owe so much to the strong women who came before us. Thanks for getting such a good group together to share their stories with us. Looks like a wonderful book, lovely cover! Fantastic giveaway, thank you to all for the opportunity! I loved The Darcy Monologues and I can’t wait to see what Rational Creatures has in store for us! Thanks to everyone for this wonderful giveaway! I like wraparound covers. Haven’t read any of these. I need more JAFF anthologies. First off, thank you to all who continue to support our indie projects and all who enthusiastically cheered this coming anthology. Congratulations to Debbie—who was selected as a winner by RandomNamePick for this announcement blog hop. Also, Sharon Legg and KasiaB won the other two gift packages via Rafflecopter. We appreciate all the support and interest. We hope you will continue to follow and talk about our project as we have many more giveaways and promotions planned for our “Rational Creatures”! Thank you soo much Christina Boyd! !